The Currency Score analysis is one of the parameters used for the Ranking and Rating list which was published earlier this weekend. Besides this analysis and the corresponding chart I also provide the Forex ranking and rating list. It is recommended to read the page Currency score explained and Models in practice for a better understanding of the article. This article will provide my analysis on the 8 major currencies based on the technical analysis charts using the MACD and Ichimoku indicator on 4 time frames: the monthly, weekly, daily and 4 hours. 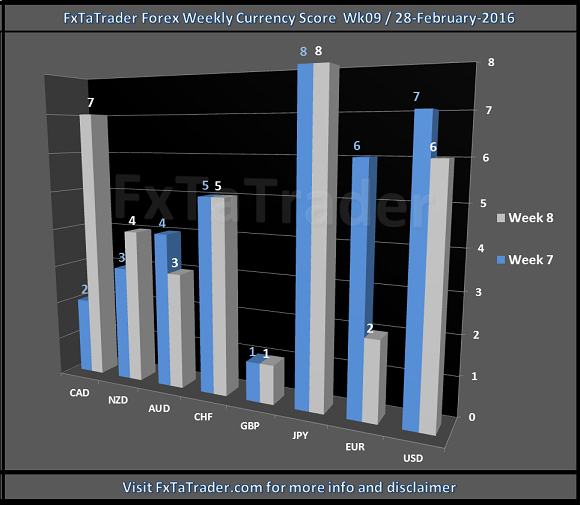 The result of the technical analysis is the 3 screenshots in this article showing the 13 Weeks Currency Score Data, Currency Score and the Currency deviation table. For analyzing the best pairs to trade the last 3 months currency classification is the first issue. When looking at the most recent score that is used for the coming period we can see in the screenshot below the deviations and we can draw the first set of conclusions. These are given below the screenshot. 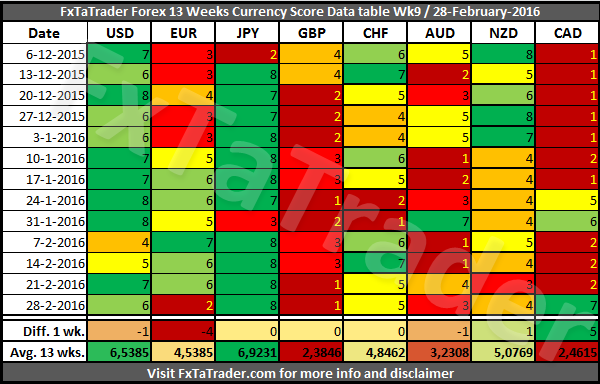 The 13 weeks currency score data and the 13 weeks average is provided here below. This data and the "3 months currency classification" are considered for choosing the preferred range. Because it is not ideal nor desired to change the range for a currency every single week, we can make several checks to avoid this. First of all the 13 weeks average and the scores over a period of 13 weeks. Both, the average and the scores can be seen in the table below. Besides this the "3 months currency classification" chart of each currency is also consulted. These have been updated and can be found in Currency Score Classification published this weekend for the coming week. A good foundation is provided for looking at the Weekly and Daily Technical analysis chart of a specific pair by using the (1)"Ranking and Rating list", published earlier this weekend, with the above (2)"Weekly Currency Score" analysis. the "Currency score" with the "Currency Score Data Table" looks for the strong trends and pullbacks. When trading according to the FxTaTrader Strategy some rules are in place. Depending on the opportunities that may come up the decision to trade a currency may become more obvious at that moment. If you would like to use this article then mention the source by providing the URL FxTaTrader.com or the direct link to this article. Good luck in the coming week.